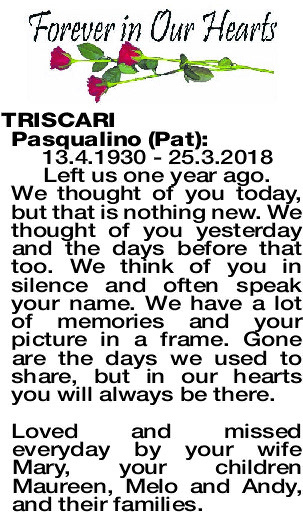 Pasqualino PAT 13.4.1930 - 25.3.2018 Left us one year ago. We thought of you today, but that is nothing new. We thought of you yesterday and the days before that too. We think of you in silence and often speak your name. We have a lot of memories and your picture in a frame. Gone are the days we used to share, but in our hearts you will always be there. Loved and missed everyday by your wife Mary, your children Maureen, Melo and Andy, and their families.